Hip Replacement, The Big One is coming to Falkirk. INTRODUCING THE CLUB NIGHT WHERE YOU CAN DANCE LIKE YOUR DAD AND NOBODY CARES. The Hip Replacement Club night will be leaving its cosy west end of Glasgow clubhouse, and heading for the bright lights of Falkirk. 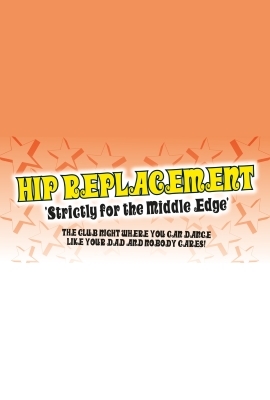 Hip Replacement have sold out the Old Fruitmarket in Glasgow two years in a row and think it’s time to light up the dance floors of Falkirk. This will be a disco dancing night to remember – so book your tickets now and don’t miss out. Too old to stay out late, but too young to go to bed? It's not easy being in the middle. And then sometimes you just want a wee dance and the weddings & twenty firsts don't come round enough. Stop dancing in the kitchen and get on the dancefloor. Yup. Its the place where middle age & cutting edge collide....where loose fitting clothing doesn't mean showing your pants....where your moves are celebrated...what are you waiting on...Dial-a-Bus?